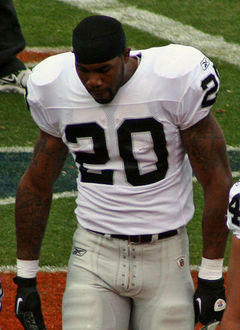 Raiders star running back Darren McFadden sat out practice again on Thursday, attending to his problematic foot injury. While McFadden was on crutches Wednesday, it appears that the Raiders are giving the notion they will keep the Arkansas alum out until next week. It makes sense, seeing it will be a short turnaround, as Week 10’s contest is on a Thursday night – and wouldn’t you want to see McFadden healthy and ready for division rival San Diego, instead of Denver? I think so, judging by the threat the Chargers are compared to the Broncos, and because it’s a tougher game away from the Coliseum. More injuries: Linebacker Rolando McClain (foot) missed practice Thursday. Safety Michael Huff (ankle) and kicker Sebastian Janikowski (hamstring) didn’t practice, either. Janikowski missed Week 7 with the injury. If the big boomer can’t kick Sunday, the Raiders will likely try to re-sign Dave Rayner, who was with the team in Week 7.